The barrel of the shield is constructed of .06" (1.5 mm) thick tungsten that will reduce radiation exposure from Tc-99m by 94%. A 5.05 density (1.5 mm lead equivalency) lead glass window provides protection and visibility. 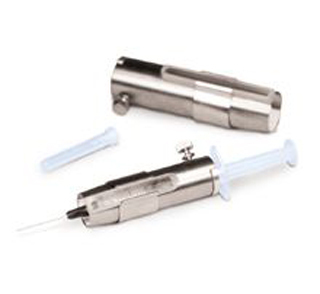 A white reflective surface on the shield interior improves viewing of the syringe's markings and fluid content. A clip secures the lead glass to the tungsten barrel and makes it easy to replace scratched or broken glass. A stainless steel thumbscrew holds syringes firmly in place.